West Coast Swing Competition Class starting April 17th at SSQQ! Starting April 17th, Trent and Michelle Haynes will be offering a West Coast Swing Competition level class for active competitors and those want to compete! Each week, we will cover different topics on all aspects of competing, such as technique, musicality, jack and jills, judging, etc. This is a great way to get ready to start competing or to take your competition to the next level. Join us for this fun and informative class! Classes will be $7 per person/class. Novice Invitational was one of the first events that I ever competed at when I first started WCS. This event holds a lot of fond memories for me, and this year was no exception. In the last year, we’ve had the honor of working with a lot of new dancers and competitors in WCS. It has been an absolute pleasure getting to see them grow in the dance and in their self confidence, and see them make so many improvements, in both social and competitive dancing. Congrats to Robert, Karina, Sherri, Troy, Leah, Emma, Amy, Shane, Lani, Alan, Karen, and Mary on all your progress and successes! A special thanks and congrats to Kevin, Louie and Roger for dancing with me in the pro-ams this year – it is an absolute privilege to get to dance with each of you and I hope you had as much fun as I did! It was also a time for some personal achievements, being on staff for the first time at this event and getting to work with the incomparable Debbie Figueroa. She has been a wonderful mentor and coach in my dance journey and I cannot thank her enough for her faith in me. Plus between her and her husband, Angel, I have achieved my next step in this journey of mine – All Stars, here I come! And since apparently, we weren’t danced out yet, last Saturday was the ever popular WCS party hosted by David Appel. David has been doing these parties for almost 10 years – and I am happy to report that he is doing these on the regular these days! David always has a great mix of popular and current music, and he always works with great venues to give us a great floor and a nice comfortable setting. Trent and I both danced hard for almost 2 hours straight and we both had some fantastic dances all evening. I apologize to anyone that I missed over the weekend – it was time to go home and ice so I can dance some more next time! Next up is Austin Swing Dance Championships! We’re busy putting the finishing touches on our SSQQ Swing Team to get ready to compete our new routine for the first time! So excited and nervous! Decompressing from the weekend. Always a fun event where we get to see so many of our wonderful new friends and tons of social dancing! We had a great time catching with new friends from Dallas, Louisiana and Oklahoma. The best thing about these events is getting to meet so many incredible people and having those zen moments, both on and off the floor. This event is completely geared towards the novice and intermediate level competitive dancers, which makes it a great venue for those starting out in competition. This year’s featured workshop instructors were Shawn and Kristen Moody and Matt and Crystal Auclair. 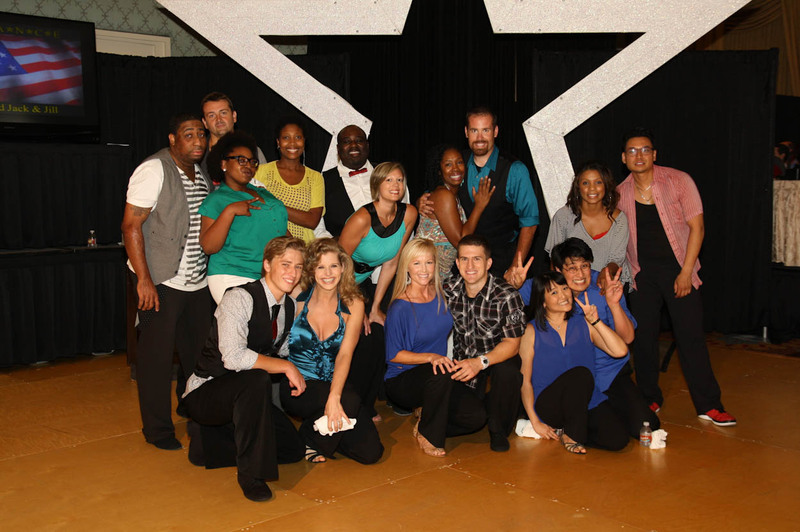 They are some of the best dancers in the nation and fantastic instructors. This is the last year that the event will be held at the Hilton Clear Lake. The hotel has made some nice upgrades to their facilities and in general, we like the hotel. But it does deter some folks from heading down because it does add quite a bit of drive for those coming in from out of town. It’s a far drive for most of us who live in Houston as well. Next year, the event will be held at a new venue, the new Westin at Memorial City Mall, which we think will be an amazing location. Easy access, in town and lots of places nearby for shopping and eating. Can’t wait! I had the privilege of getting to compete with my two Ams, Matthew and Louie, again. They are really great dance partners and always a pleasure to dance with, socially or in competition. Trent and I also got to compete in the Advanced JJ this year. He drew Enola from Oklahoma, one of the nicest and funniest people we’ve met! Since we had more guys than ladies, I ended up having to dance twice, with Henry from Louisiana and CJ from Dallas, both incredibly smooth dancers. I’ve drawn Henry before and it is always a pleasure. I haven’t danced with CJ in awhile – our paths just hadn’t crossed lately, but we also had an amazing dance and to our surprise, a 3rd place finish, amongst some of our toughest peers! It was definitely a nice surprise to end the weekend with.